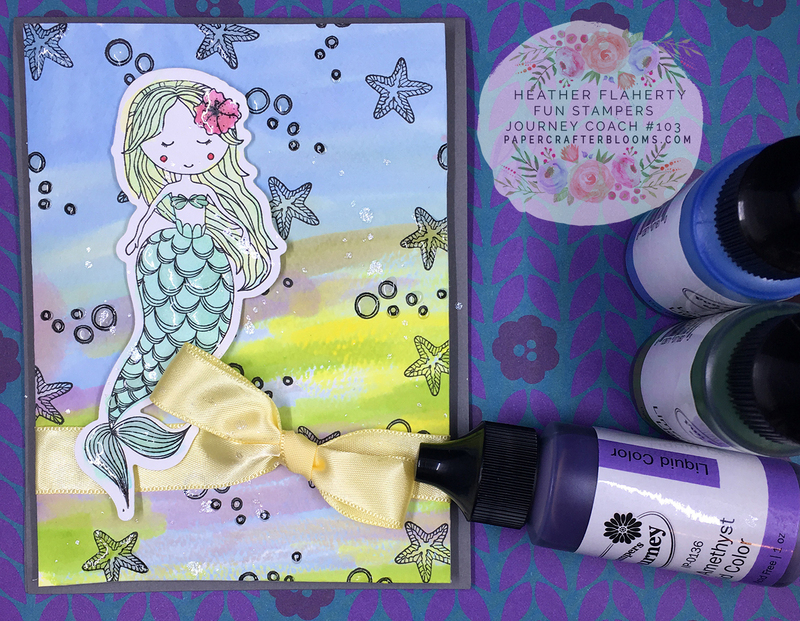 Welcome to the Bloom Box Blog Hop! 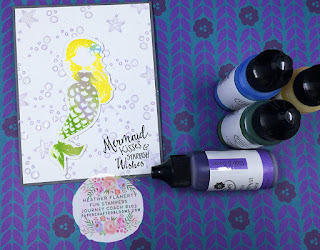 We will be Bringing Paper to Life with the Mermaid Kisses Bloom Box. I'm so happy you're hoppin' along! If you have arrived here from Kristina's blog, you're on the right track. If not, that's ok too! Just continue the hop and you'll come full circle! This mermaid card started out as an idea, and it didn't end exactly like I imagined I still love how it turned out. 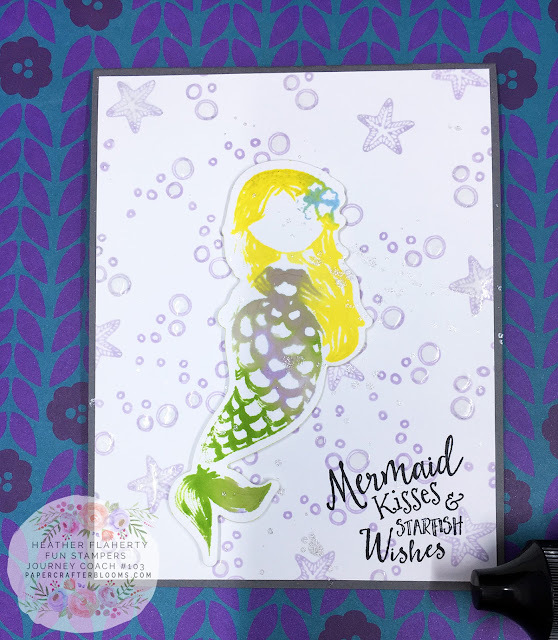 I started with a Fun Stampers Journey Color Splash sheet then the started creating the background with the starfish stamp in black licorice and filled in the remaining background with the bubble stamp also in black licroce. 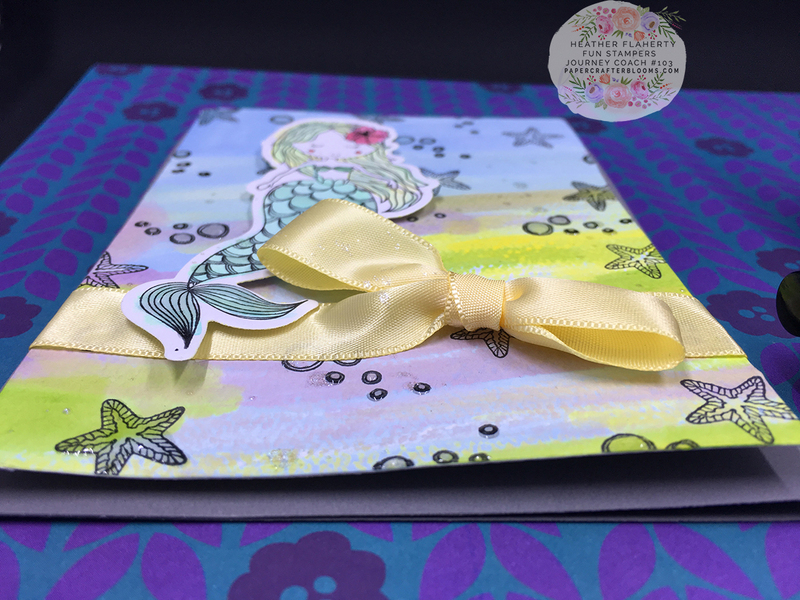 I tied a bow using Sweet Pear Satin Ribbon and Popped the front of the card off the base. 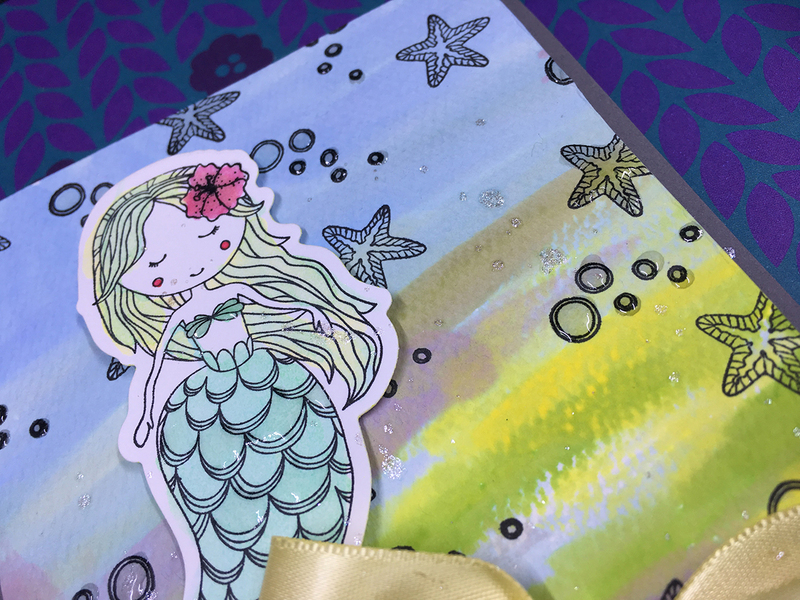 To complete the look of the card I added journey glaze to some of the background elements as well as the mermaid. 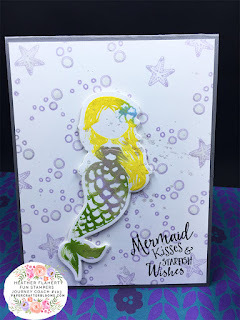 This card was created using the same technique as the first card. However, I did not use ColorSplash sheets just whip cream card stock. I used the liquid colors on the mermaid image instead of stamping it, then I laid my cardstock on the stamp and rubbed over the stamp onto the back of the cardstock to get the image to the paper. 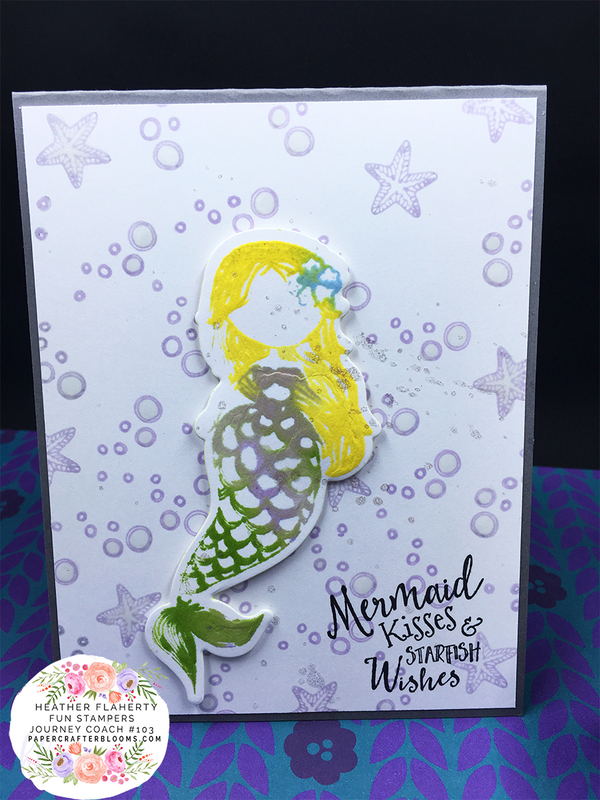 I then die cut the mermaid out using the RG Amaze. The background was created using the pretty amethyst ink pad and finished with journey glaze on the bubbles of the card. Here is a Quick Video of the process for the 2 cards. 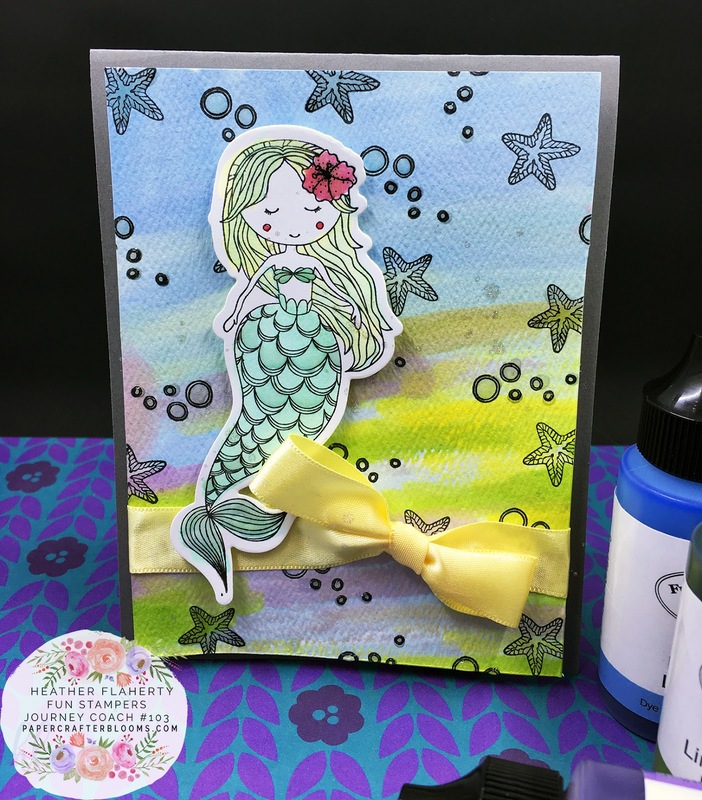 Thank you for stopping by today, be sure to head to Crissy’s blog next. 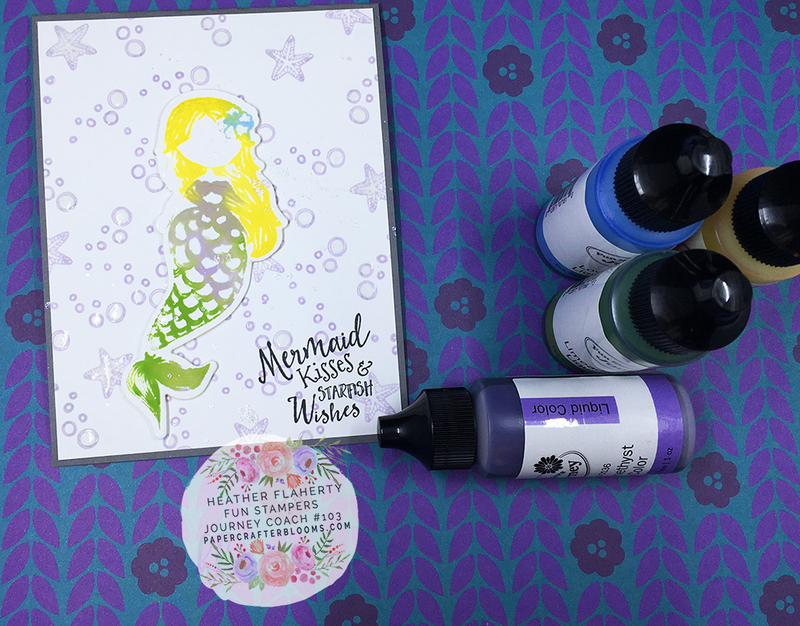 I'm excited to try our liquid colors, thanks for sharing. Adorable card! I love your Blog! The colors you chose for your cards are adorable. I love your shopping cart at the end for easy shopping! I can't wait until I get my liquid colors! Great cards! Love the Liquid Colors. 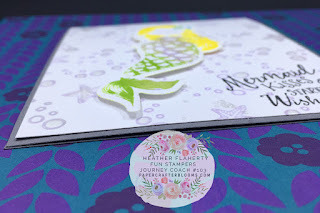 Hi Heather, great card. The liquid inks look like so much fun. I am looking forward to trying them out sometime.